This bar reminded me of a bar that used to be out when I was kid. I confess I can’t remember who manufactured it, perhaps Thorntons or Marks and Sparks, but it had a similar concept of layering milk, dark and white chocolate and was made by a posh company. This new “big” bar from Cadbury is called Big Taste Triple Chocolate Sensation and has three layers of chocolate. Just before I opened it I had a quick read of the back of the pack, a couple of things struck me. Firstly I hadn’t realised this bar contains nuts. The ingredients lists hazelnut paste, and when I turned the packet back to the front I did notice a logo saying to check for allergens, but it hadn’t quite dawned on me there would be nuts in the bar. It is funny to think we live in a world where UK Peanut Butter “flavour” Oreos don't contain nuts, but this triple chocolate bar does. Oh well. I’m not sure what the term “dark milk chocolate means” surely it is one or the other? I know some posh brands have a heavy cocoa content in their milk chocolate and it is still labelled as milk chocolate, so I don’t think there is any reason to create a new in between version. Talking of cocoa content, that can’t be what is in the brackets? The “dark milk chocolate” is lower than the “milk chocolate with white chocolate”. Finally, why have they given the percentage for those two types together? I don’t get it, but if you do - please drop me a comment below. I think I spent enough time worrying over the packet and decided to actually open the bar. The bar is fab to look at, the layers of chocolate do look very smart with their “dark milk chocolate” on top. It is proportioned out into triangles and did break up very easily. 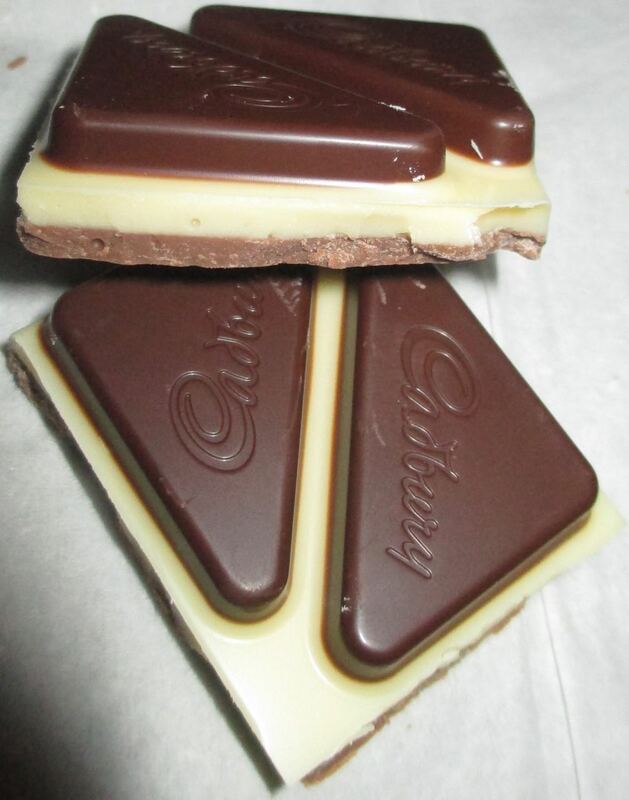 The flavours of the three chocolates mingled together creating a pleasing sweet chocolate taste. It was creamy and rich and soothing to eat, I did really like it. There is no nutty taste though, none at all. If I hadn’t read the packaging I wouldn’t have guessed there were hazelnuts in there from the flavour. This is a fun bar, its shape and colours stand out, and it was clearly made for sharing (the bar is huge). It is one I’ll buy again because I liked the flavour, even if I couldn’t get my head round some of the text on the wrapper! I think it may be the QUID (quantitative declaration ingredient declaration) for the types of chocolate though QUID is usually by single ingredient. It sounds just as though it is proportions of the twinned types of chocolate, not the cocoa percentages. But that still doesn't add up... 42% + 25% = 67% There isn't 33% of anything else (as far as I could see)? It's a direct copy of Milka Triolade. Been buying this in Spain for years, where it's sold in pretty much every supermarket, and come home with a suitcase full. These are all Milka products re-packaged.